The Rock Drill 4069 is a touch-driven synthesizer with a unique look and a mean sound. The deceptively simple circuit creates an amazing range of organic sounds in response to the connection between the performer and the touch pads. The project involves no microcontrollers and relies entirely on classical electronics being pushed in to interesting distorted operation for its effects. The sounds produced are a mixture of the expected and controllable and the totally unexpected as the system tips in to chaos. The sound is always raw and menacing. Inspired by designs like the Electronic Dream Plant Wasp synth the Rock Drill 4069 uses a standard logic chip from the 1980s in a very original and unconventional way. Technically the circuit consists of two interacting oscillators, one audio frequency and one low frequency, driving an distorting amplifier. 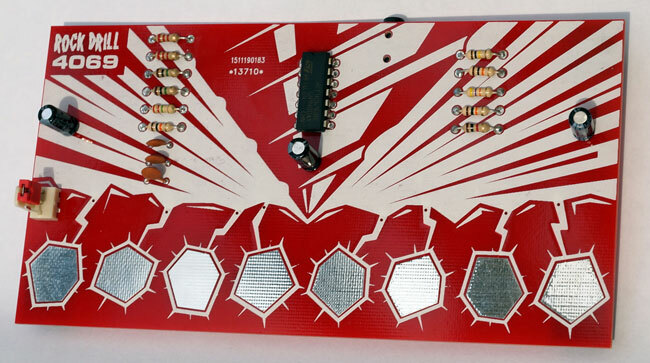 The touch pads make the player's body part of the circuit and provide many levels of feedback and connection between control voltages and signals in the system. The Rock Drill 4069 is powered by a 3 Volt coin cell and is completely safe in operation. The Rock Drill 4069 is available as a kit to build yourself. Building requires soldering, not really hard soldering, but hot metal is involved. For more information see the build instructions and manual (PDF). Sorry about the crackles on this video - they are due to some problem in the recording chain and are not part of the real sound. Play on a system with reasonable bass, not though horrible tablet speakers, for best effect.